The Design Toolkit for Educators, created by Design Firm IDEO. 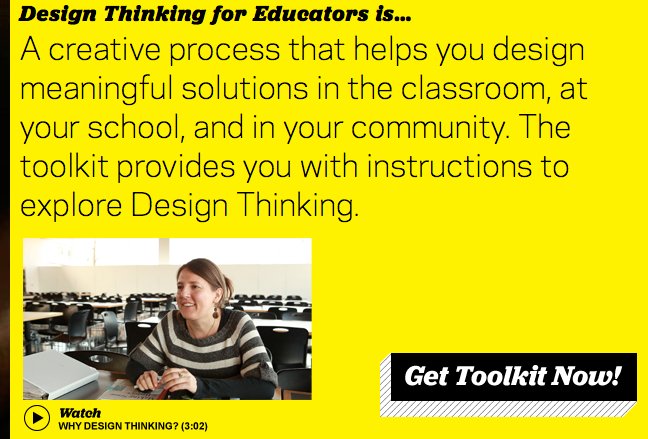 Helps educators use Design Thinking to address classroom challenges. No doubt readers are familiar with the term Design Thinking. The concept of Design Thinking has yet to reach levels of MOOC mania, however it’s a movement in its own right. The recent surge of design-thinking-as-a-method coverage by various newsletters and journals is due to its success in the business sector, mostly with consumer and technology companies. The shift to the customer-in-the center of the process is one factor that has motivated companies and now education institutions [with its own shift to the student-focused model] to implement the Design Thinking approach. As I’ve been working on my book Course Design for a Digital Age, I’ve encountered the Design Thinking concept time and again in the context of education. Though I determined that Design Thinking is relevant to instructional design, I do question the merit of implementing Design Thinking into school curriculum, which I found in several instances. In this post I’ll describe Design Thinking and examine why and how it is relevant to educators. It’s worth examining, not only because Design Thinking is ‘in’ right now, but because educators may benefit from knowing the principles of Design Thinking and its applicability to education environments. Design Thinking as a concept is vague. There are numerous definitions, some that contradict. However it’s safe to say that it’s a way of thinking; thinking that follows a loose framework where insights are collected from a variety of sources that ultimately guide activities toward a solution. However, I am not convinced that Design Thinking is applicable to all sectors as we are led to believe, particularly in K-12 education. Design Thinking requires a breadth of knowledge and experience from various disciplines, which is not present in most K-12 students given the stage of their cognitive development and education background. It requires one to think of a problem from unconventional, even unlikely perspectives, that lead to a collection of insights—insights that will ultimately produce a unique solution. Design Thinking has also been described as using a “close, almost anthropological observation of people to gain insight into problems that may not be articulated yet” (Korn & Silverman, 2012). Do K-12 students really have the education background to engage in Design Thinking? I suggest that teaching this process to K-12 students is not only unfeasible, but unnecessary and limiting. Rather than spending time teaching a structured, cookie-cutter problem-solving process, time might be better spent teaching, and facilitating learning in a breadth of subjects. Rather than give students more structure, they may benefit from less, yet more learning. To think outside of the box, to have multiple perspectives, students require an education grounded in the humanities. Yet Design Thinking is alive and well in K-12 education, even in higher education. 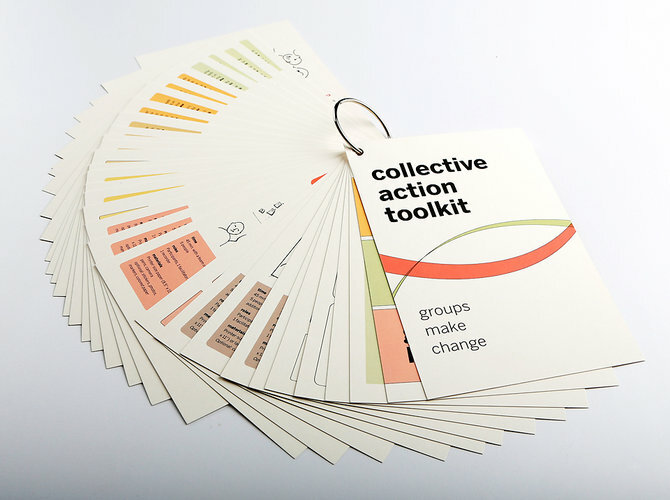 Two design firms, frog Design with its open source Collective Action Toolkit, and IDEO’s Design Thinking for Educators, created resources for educators, packaging up the concept into a step-by-step framework. However, there is two different approaches. One that encourages educators to use the Design Thinking process themselves to address challenges in the classroom, and the other to teach students how to use Design Thinking as a problem solving process. Design Thinking reinforces why an education that includes a breadth and depth of subjects is essential. And, not only in K-12, but in higher education—not just science for the engineers, but art history, world literature and philosophy. Conversely, students of art history will benefit from studying, biology, mathematics and physics. It is educated, mature students that will be ready to apply Design Thinking—to develop insights from multiple perspectives and solve real-world problems with critical thinking and analytical skills. Thinking carefully and critically about the applicability of Design Thinking is time well spent. Update: A very good counter-argument to this post, Why You Should Use Design Thinking Approaches in Education on the blog, Unexpect. As a teaching artist, and professor of art education, Design thinking is defined in the realm of K-12 education in various ways. However, your assumption that “Design thinking” doesn’t belong in education or schools is outrageous and in total opposition to the role of contemporary visual arts curriculum design and activities art teachers are increasingly using. Informed by contemporary artist practices of Big Ideas, key concepts and essential questions using conceptual mind mapping or webbing to approach a problem, or new STEM-STEAM integration projects, or studying the architecture of nature to problem-solve, sketch, build and test novel prototypes, or landscape planning for movement through space, or analyzing visual culture texts, deconstructing semiotic myths, and restructuring social narratives to “redesign society”, the list of projects and savvy student outcomes is surprising. Good thing because its these students who will become the next future designers. For many artists, its not a methodology but a way of being. Thanks for giving me some unexpected food for thought! All the best. One of the biggest challenges anyone who is looking into Design Thinking has today is differentiating between “design thinking” – the way designers think, and Design Thinking – the method of problem discovery and resolution utilized at IDEO. Nigel Cross and others have researched and written about how a wide variety of designers create within their fields, architecture, engineering, software (which is really language). The vast majority of these discussions focus on the analytical and procedural process of invention. David Kelley (Stanford/IDEO) built on what he learned in the Product Design program at Stanford in the late 70’s and founded both IDEO and the d.school at Stanford on those principles and decided to call it design thinking. Purely analytical approaches to solving engineering problems work. However, as situations becomes more complex and ambiguous, the human, emotional elements begin to become more significant. This is where the scientific method begins to break down. For a better understanding of how Design Thinking works in classroom settings, you should visit the d.school’s K-12 web site, or better, take one of the K-12 educator’s workshops. Design Thinking and STEM/STEAM education compliment each other beautifully. DT lives at the intersection of art (feeling), engineering (technology), and doing (business) and is where the deepest, most effective learning occurs. “Design Thinking requires a breadth of knowledge and experience from various disciplines, which is not present in most K-12 students given the stage of their cognitive development and education background. It requires one to think of a problem from unconventional, even unlikely perspectives, that lead to a collection of insights—insights that will ultimately produce a unique solution.” This very statement is why design thinking work is even MORE important in a K12 setting. Design thinking is a mindset, a creative muscle that doesn’t magically grow when someone graduates from the 12th grade and enters higher ed. That very skill you mention — thinking of a problem from an unconventional perspective — this skill should be cultivated in a K12 setting. Are we preparing our students for “doing school” or for handling the complex world issues around us? Yes, the humanities and subjects are important, but I’m not convinced design thinking can’t play a role in the teaching or packaging of those subjects. Do students develop those skills first, then they can use design thinking, or can we use design thinking to help develop those skills in students? And even if the latter is difficult and challenging, and beyond what we know NOW to be true, it doesn’t mean it isn’t worthy for us to try to figure it out. risposta in questa argomentazione. Vi ringrazio in anticipo per il Vs. tempo. You may consider modifying the title of this post. It’s a bit sensationalistic considering that you suggest that Design Thinking does indeed have a place in schools although is not appropriate in all sectors. Reblogged this on enivel's Blog. If you know about design thinking you might consider it a great idea for improving education, however, it is difficult to base all the work done in the classroom or at least most of it because it demands time, and we all know that in schools, this is something we are constantly running out of. Just seeing this post from a search I was doing. I appreciate your perspective but, as a 25 year collaborative innovation consultant leading teams of corporate executives through the Innovation Process (which includes Design-Thinking in the center steps) and a former — long ago — Early Childhood teacher, I respectfully disagree whole-heartedly with your assessment. Students in K-12 actually have a more natural, instinctive facility in using the kinds of thinking and problem-solving required for Design-Thinking. In fact, I have spent much of the past 20 years trying to help Corporate Executives get BACK to that way of thinking. The reason we should integrate Design Thinking and Innovation tools into K-12 curriculum is to help all those K-12 students hold on to that natural ability and value it alongside more traditional critical thinking skills so they can grow up to be whole brain thinkers that are naturally innovative vs. adults who have let that skill taper and atrophy (or more exactly have been through education programs that have encouraged them to focus exclusively on critical thinking skills. That said, I think the toolkits cannot bring to life the collaborative, energetic, messy but wholly effective nature of Design-thinking. I think until you try it for yourself it is IMPOSSIBLE to make a judgement on the use of design thinking in school curriculum. I teach 5th grade and utilizing this methodology has transformed my classroom, my thinking, my students ability to tackle challenging problems, my students motivation level, etc, etc, etc. Change is not easy and it was very messy at times, but I will continue to move forward and work with like-minded colleagues to incorporate design thinking into our curriculum as I found it to be well worth the effort!! Thanks for your input and sharing your experience with implementing design-thinking into your class room teaching. Can you share with readers which model you used? Thanks! It appears that the author does not make a clear distinction between K-!2 education and college education. He might be right that, in the general context of our public school education, design thinking might be a distracting approach from the learning of basic literacy ( English, Math, Humanities, Science, Arts ). The main purpose of K-!2 education is, in my opinion, to provide a basic education that achieves a good, unbiased understanding of our culture and an initial ability to identify personal interests and talent. College education is supposed to provide an “opening of the minds” and an ability to make constructive contributions to our culture. Unfortunately much of our current undergraduate college education focuses on remedial work , due to the poor performance of high schools, or worse, orientation and “enrichment” courses that often have marginal academic merit, are often intended to serve political interests, or are just a cover up for party time and additional income for the college. If college education is characterized by rigor, academic excellence and intellectual integrity imaginative courses focused on design thinking will bring an important contribution to the education of our future generations of young adults, a real opening of the minds. You are not acknowledging the vast amount of skills K-12 kids pick up extramurally. I have worked with 16-18 year olds as volunteers and interns to organise festivals, running their own radioshows, bringing out their own school newspaper, raising money for and organising proms. I am always AMAZED at their creative capacity these days. And Design Thinking is certaining being applied there. Sadly these out of class projects are mostly also where their passion and acquisition of transferable vocational skills lie and they are not factored in for assessment either. I really think you give them too little credit and place too much emphasis on their in class experience. Educationalists sometimes lack real world experience other than as teachers so would also struggle setting and scaffolding authentic learning. In terms of the concept “Design Thinking” as being vague, I agree , but also look at concepts that are very closely related, many of those are pretty well defined like “design reasoning”, “design rational”, “abductive reasoning”, “analogical reasoning”, “heuristic reasoning” ect. I agree with John that the focus is the “process” rather than the product and the earlier students are exposed to noticing and practicing their thinking processes, the more time those processes have to mature with the student. Interesting perspective on an approach that is, indeed, growing in popularity even as it is an approach that is not all that new. As to the question of whether design thinking is a “limiting” process, my experience has suggested that, while it is a process, it is not necessarily “cookie cutter.” One doesn’t quite stamp out a result when applying a design thinking process. Rather, the process is more of a road map for thinking through a challenge and doing so in an interdisciplinary, collaborative way. K-12 educators who find promise in design thinking tend to do so because it taps in to the naturally inquisitive and curious nature of children and respects their thirst for agency. In doing so students can apply academic disciplines, such as math, science, engineering and the arts to create practical solutions to challenges they face in their school or beyond. Thanks for the link you provided re the brief history of design thinking. This is interesting, as it touches on the idea of critical thinking which one could argue is quite similar to, if not the same as Design Thinking. I’m finding that Design thinking is a vague term given the scope of the concept – which centers on thinking – which as we’ve seen can mean creative thinking, problem solving, innovative thinking etc. Thanks for sharing your experience with the application of design thinking in the classroom. Perhaps you can shed light on the research [re. case studies, theory etc] which seems to suggest that the leader[educator] needs to be highly skilled in facilitating the Design Thinking process. For example this recent application with a group of high school students, http://www.fastcodesign.com/1672941/want-to-help-kids-solve-problems-have-them-design-their-own-solutions, it seems to highlight the need for a highly skilled group leader, which in this case there was. As far as cookie- cutter process, what I was referring to was the tool kits provided by IDEA and frog Design. Thanks for you comment John. First of all, thanks so much for writing this article. As someone who just recently became very interested and passionate about design-thinking, it was very eye-opening and unnerving at the same time. I recently became very passionate about the potential of the design process to tackle many of the seemingly impossible problems we face today, right at the end of college where I was studying physics. So even though I became very inspired, I also had no experience in design whatsoever. I was especially inspired by the two toolkits that are criticized in the article, because it provided a great entry point in learning how I can apply the design process myself. I have a teaching internship in India in a year, and I was hoping to apply the design process and use that experience to craft a curriculum where I can act as a facilitator while the kids use the design-thinking methods to solve their own problems, much like what frog designers did using their toolkit. However, after reading your article and some others, I’m now much more aware of how dangerous it would be to approach the design process as some kind of magical thing that will yield amazing results. My question is, after reading Emer Beamer’s response, do you still think design thinking is the wrong choice to use as a teaching method? Or that, because I have lack of experience, it would be foolish to think that I can really understand the “essence” of the design process and be a effective facilitator? First of all, I applaud your job choice of completing a teaching internship in India! This is a tremendous opportunity to gain real world experience and deepen one’s understanding of societal problems and to provide support to others. To answer your question, whether the design process tool kits might be a wrong choice for a teaching situation such as yours – my answer is it depends. The design tool kit is one method of instruction, a model to follow-up to facilitate learning – but here is where one needs to begin – Don’t start with the method, (i.e. the toolkit), start with the learning problem or goal. What are the learning goals for the group of students? What is the intended learning outcome – after you teach these students what do you want them to be able to do? Here is where the educator should begin. The next step is choosing the method, the instructional strategy for facilitating the learning. When selecting the method, one has to consider the learners — their developmental phase, skills in reading, writing, math (as might be needed to achieve the goal), and the learning context, where they students will be learning and what tools they will have available. If one of the learning goals is to develop students’ problem solving skills that they can apply the skills to their community and become an agent of change, or to develop cultural awareness, etc. then the design toolkit may be appropriate. But it will depend upon the factors I listed. The toolkit method is a structured approach, and one that requires that the students have a specific set of skills – this is another factor to consider. Without knowing your situation, I can’t provide a more specific answer – I apologize – but what I am trying to say is, start with a different question, what are the learning goals, and what will facilitate that learning best?